Note: Please consult our Mac App Store listing for the most recent changelog. • Fixed sorting of recipes by cook time or prep time in the recipe column view. • Fixed sorting of recipes by Most Recent or Top Rated when you also have a column sort set. • The previous release was incorrectly marked as compatible with macOS 10.11, however Paprika 3 requires macOS 10.12. This update corrects the minimum system version requirement. • Fixed a few crashes. • Fixed an issue with timers not counting down correctly while the computer is asleep. • Correctly refresh the recipe view when editing prep time, cook time, and difficulty. • Added a few more keyboard shortcuts. • Improved text selection when using the browser clipboard tools. • Fixed missing scroll bars in the recipe screen. • Fixed missing buttons in fullscreen mode under Yosemite. • Fixed a minor issue where the window height grows slightly each time the app is launched. • Fixed a bug where popovers would get stuck in the browser. • Fixed a few minor issues with the YummySoup and SousChef importers. • Fixed a crash when syncing meals. • Fixed encoding issues with HTML exports. • Added support for OS X Yosemite. • Added a SpringPad JSON importer. • Added support for scaling recipes by arbitrary percentages. • Added support for the en dash when scaling recipes with a quantity range. • Added print options for a larger photo, and two-column layout. • Added support for duplicating recipes. • Added support for directly exporting a single recipe. • Added a confirmation if you try to close the app while in the middle of editing a recipe. • When copying images in the browser, they are now also copied to the clipboard so they can be directly pasted into an existing recipe. • Added support for users with multiple keychains when storing Paprika Cloud Sync credentials. • Changed wording of the confirmation button when you cancel a recipe edit to something less scary. • Removed the Request Site button in the browser, these are now recorded automatically. • Made the ingredients text box resizable when editing a recipe. • Correctly update a timer's name after it has been changed. • Fixed a bug related to re-saving recipe photos unnecessarily. • Fixed a crash by disabling the ability to print a recipe you are in the middle of editing. • Fixed a bug where ctrl-click was not bringing up the context menu. • Fixed a bug related to the sorting of recipes when in the detailed list mode. • Fixed a few bugs related to the thumbnailing of photos. • Fixed the ability to login to various websites using Facebook/Twitter/Google+. • Fixed importing of .paprikarecipe files. • Made a few tweaks to the MMF importer. • Correctly store the meal planner's export calendar name setting. • Made it easier to drag a subcategory out of its parent category to the top level. • Fixed print behavior when viewing a recipe through the meal planner. • Fixed problems with editing recipes viewed through the meal planner. • Tweaked grocery list printing to reduce space between items. • Restored ability to drag-and-drop images from the browser into the clipboard tools. • Fixed serving size when printing/emailing/exporting recipes if the recipe is scaled. • Fixed a bug that caused the meal planner to show up blank. • Fixed a bug with ingredient scaling. This release brings the Mac version up to date with the iPad and iPhone versions. Thanks for all of your patience and support! 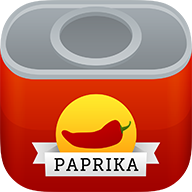 • Paprika Cloud Sync has been greatly improved. It will now push changes in real-time between your devices, and sends only the changes made since your last sync. • Fullscreen support has been added. • Subcategory support has been added. You can now drag-and-drop categories into and out of subcategories. • You can now sort any category by Top Rated or Most Recent. • You can now tap ingredients to cross them off as you use them, and highlight the current paragraph of your recipe directions to help keep your place. • To make it easier to cook multiple recipes at the same time, you can now pin active recipes to easily switch between them. • Timer support has been added. Timers are automatically detected in your directions, simply tap on one to start a new timer. • Recipe printing has been improved. You can now customize: print sizes (full page, 4x6 index cards, 3x5 index cards), print margins, font size, and disable the photo. • If your recipe was clipped from a website, and it has an image, you can now tap the image in order to zoom in on a larger version of it. • The address bar and search bar have been combined into one unified bar. • We have redesigned the clipboard tools to make them easier to work with. You can expand and contract them to view the recipe you are currently clipping. • When you import a recipe from a website, the recipe is now copied to the clipboard tools, to allow you to make adjustments before you fully save the recipe. • You can now export your grocery list to Reminders. • The pantry is a new subsection of the grocery list. You can record common ingredients that you already have at home: salt, sugar, flour, etc. Pantry items are automatically unchecked when you add a recipe to your grocery list. • The meal planner has been redesigned with two new views: a monthly view and a weekly view. • You can now add recipes to the meal planner by dragging them in from the recipes sidebar. • Meals can now be copied or moved between days of the week via drag-and-drop. • You can now export your meal plans to iCal. • Menus are a new subsection of the meal planner. You can take your favorite meals and create reusable menus from them, to be saved for later use. • You can now import MasterCook (mz2) files, and Living Cookbook (fdx/fdxz) files. • Fixed problem with links on certain sites not loading properly (e.g. Pinterest). • Fixed loading indicator in browser. • Added support for Retina display. • Improved Mountain Lion support. • Twitter & Facebook integration (Mountain Lion only). • Miscellaneous bug & crash fixes. • Fixed bug where emails would sometimes get cut off. • Fixed bug where recipe scaling sometimes would not update. • Added better crash reporting. • Fixed bug with tiny image resizing in browser. • Fixed crash when opening recipes from the meal planner. • Added support for importing from MasterCook (.mxp), SousChef (.vrc), and MealMaster (.mmf). • Fixed issues exporting multiple recipes with the same name to HTML. • Added support for Sandbox mode. • We now use your default mail client when sending email. • Added an alternate recipe listing that shows more data at once. • New Top Rated category sorts your recipes by star rating. • You can now remove a recipe's existing photo. • Added a Clear Purchased option to the grocery list. • You can now customize the start day of the week for your meal plans. • Added shortcut buttons to move back and forth between weeks in the meal planner. • Added our Supported Sites page as the default bookmark in the browser. • Bookmarks will now sync via Paprika Cloud Sync. • You can now export your entire recipe collection to HTML. • Made sure that VoiceOver works properly throughout the entire app. • We have added translations for the following languages: Chinese, Czech, Danish, Dutch, Finnish, Hungarian, Italian, Japanese, Norwegian, Portuguese, Swedish. • Fixed problems some users were having when upgrading from earlier versions of the app. • The ingredient scaling and grocery list now correctly understand fraction characters. • Fixed a problem restoring from a previous backup. • Added support for the following languages: French, Spanish, and German. • You can now turn off grocery list consolidation and aisles in the settings pane. • Fixed problems with missing ingredients when adding recipes to the grocery list. • Fixed import of MasterCook MX2 files. • Fixed issue with alphabetically sorting categories. • The grocery list now consolidates similar ingredients (so '1 egg' and '2 eggs' will be added together and displayed as '3 eggs'). • The grocery list now displays items sorted by grocery store aisle instead of by the recipe name (so milk shows up under Dairy and carrots show up under Produce). • When adding recipes to the grocery list, you can now select/deselect individual ingredients to add (instead of always adding the entire recipe). • You can also now add the same recipe to the grocery list more than once. • Fixed an issue with selecting certain dates in the meal planner. • Fixed an issue when adding new categories with blank names. • Fixed a potential corruption problem when emailing recipe attachments. • Added significant performance enhancements for users with databases containing over 20,000 recipes. • Improved the performance of the app while running Paprika Cloud Sync. • Improved the print and email formatting of recipes, grocery lists, and meal plans. • You can now update recipe photos via drag and drop onto the image well when editing a recipe. • Added ability to select multiple recipes to delete. • Fixed bug where recipe fields weren't updating when clicking from meal planner. • Added support for importing from Yum XML. • Fixed import of blank categories. • Fixed category importing from YummySoup!, MacGourmet, and MasterCook. • Fixed text cutoff issues in recipe screen. • Fixed case insensitive recipe name sorting. • Fixed drag and drop of recipe images in edit recipe screen. • Fixed issue adding meals to last day of week from recipe screen. • Making notes and nutritional info text views multi-line editable. • Window properly remembers last position. • Correctly dismiss tooltips when switching windows.